The Table is Being Set - Seattle Professional art hanging, art moving and art consultant. MOHAI’s curatorial team is in the final preparation stage for Edible City: A Delicious Journey. After extensive planning, researching, writing and designing, it’s excitning to see the exhibit ready to share. Edible City features 300 artifacts from more than fifty lenders. They range from Pike Place Market aritfacts and the original Monorail Espresso cart, to historic and modern images from MOHAI’s photography collections. We carefully research and clean each object to make sure it looks its best, then build custom mounts to keep them safe while on display. Once the objects are cleaned they are ready to travel to the museum. Even large objects like this Victorian farm cart, have to be carefully wrapped and padded to keep them safe on the journey. If museum exhibits are an art form, our canvas is the gallery space. For each exhibit like Edible City, we transform the Walker Gallery. We build and paint walls, create platforms and design cases, install new interactive features, and much more. Imagine if you renovated your house every few months. It’s a lot of work to put together an exhibit like Edible City, but it’s worth the effort. We know you’re going to love learning new stories and seeing old favorites. On behalf of the exhibits team and everyone at MOHAI we cannot wait to welcome you to Edible City: A Delicious Journey! 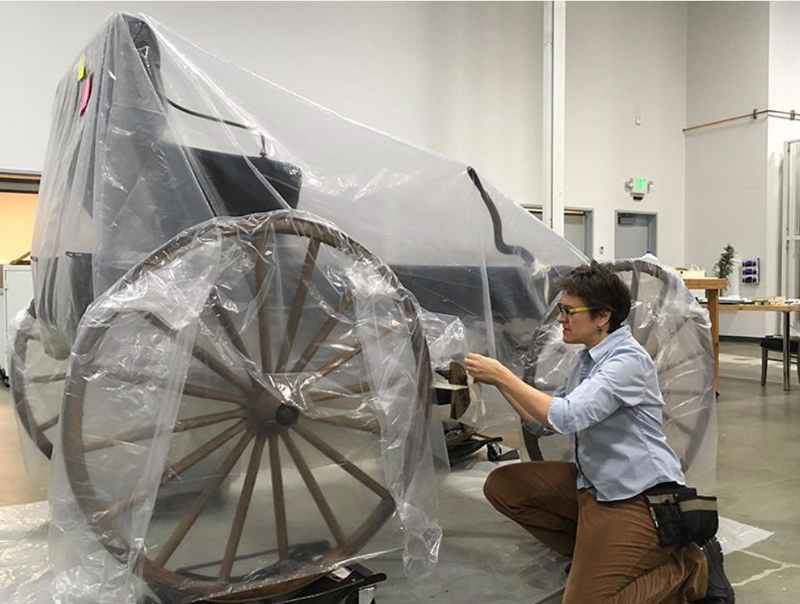 Feature Photo: Elizabeth Mauro of Art Installation, LLC is seen putting the finishing touches on preparing an 1880 Spring Wagon for transport to the Armory. This particular wagon came from a farm near Cottage Lake, WA.